If you're turning your nose up at the word rose, you're cutting yourself off from a whole fascinating, historical, cultural phenomenon. I love roses. Not the fickle hybrid roses that need spraying and coying and coiffing. Or god forbid, a shade-casting umbrella on a hot day. I love a good old fashioned, passed-along, rose. The equivalent to women with child bearing hips. Right? 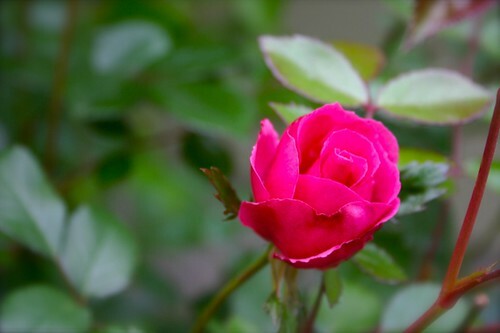 And the first rose blooming this year in our garden is this one. Enjoy the decadence of what we call Anne's rose. The rose that came from our friend Anne, and her great-aunt in Washington. What rose it was? I do not know. It's a pass-along. And it rarely gets black spot, never has shown signs of rust, it responds well to light pruning, but other than that? Requires very little. I don't like fussy roses. But the old, heirloom roses like Anne's rose? Special and wonderful. Do you grow roses? Do you love them? Hate them? Lay down on the couch and tell the rose doctor your feelings, won't you? I love the single roses. when we moved into our house, the first thing we did was dig up all of the diseased nasty roses the previous owner had planted. they just looked like hell, with their black spot and spindly twigs. however, i did propagate a lovely rose from my old apartment--a climber (or leaner). it smells great and we can keep on top of the black spot with careful management. aphids are sprayed off with soap and water. my pet peeve? roses that don't smell delightful. Well Rose Doc...I just don't like their spindly look. At least while Rhody's aren't blooming they are a mass of green. I do like wild roses...the ones you see by the sides of roadways in the country. I've had mixed luck with roses, but generally they've only lasted a year or two, even though they're the "old fashioned" bush kind. I hated roses until I met a Joseph's Coat rugosa. I love that one. The rest of them are like a snooty siamese. I looove roses, but I had never grown any until we bought this house, with 3 rose plants already on it. The one by the back door has the most amazing smelling roses, it's almost too much. I don't do anything for them except hack them back when they get too big. I'm not a rose expert, by any means. I don't like fussy roses either. I like shrub roses or any rose with big hips. For my health, I use rose petals and hips in tea/infusions. I use a lot of them. Chook-nasty diseased roses deserved to be dug up and removed. I'm with you about being peeved about roses without scent; what's the point?! Danger-Have you seen the huge-thorned roses you grow for their thorns, not their roses? They look very, very dangerous. Heather-That's strange about them not living long. I've read about roses still surrounding settlers sites in the west, even if the houses are gone. Isn't that amazing?! Maggie-Snooty siamese! If my roses start talking back to me like siamese do I'm going to be very concerned. Jacquelyn-The kind you don't do anything to are the best! Cathy-I'd love to hear more about how you use the rose petals and hips!